ImageSkill Magic Enhancer: Improve your photos by one click! 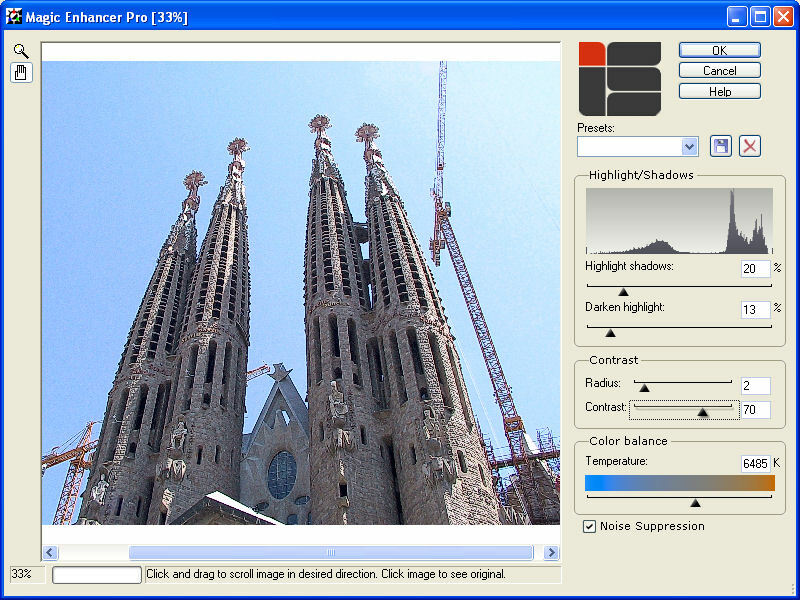 ImageSkill Software has released of ImageSkill Magic Enhancer plug-in for Windows. Using Magic Enhancer you can essentially improve your photos – adjust lightness, contrast and color balance. Magic Enhancer is perfect for enhancement image and photo with lack of lightness or uneven illumination, silhouetted images on dark background. You can adjust local contrast of your photos, emphasize fine details and make your photos more expressive. Convenient color temperature control allows fixing color balance defects easily. Plug-in has attractive and user-friendly interface, when in use you can keep an eye result histogram. Plug-in has simple install and uninstall procedures and automatically detects more popular suitable graphics hosts. Demonstrations of the plugin's features are available in ImageSkill online Tutorial. ImageSkill Magic Enhancer is compatible with Adobe Photoshop and Photoshop Elements, Macromedia Fireworks, Corel (Jasc) Paint Shop Pro, Corel Painter, Corel Photo-Paint and Microsoft Digital Image Suite. ImageSkill Magic Enhancer runs on Microsoft Windows 98/ME/2000/2004/XP/NT3/NT4/Vista. ImageSkill Magic Enhance Lite is a free. The professional version of ImageSkill Magic Enhancer Pro is available in English for $29.95 including VAT. Just now, we upgrade our products for registered customer free of charge.